At Ollie Burns Funeral Directors, we appreciate the value of everyone. We have been in business since 2017, providing a service that is based on a commitment of best practice and our understanding of a family’s needs. 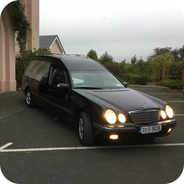 We prepare the deceased for viewing by liaising with qualified embalmers. We co-ordinate arrangements with the Clergy and take care of appropriate offerings as well as organising Press and Cemetery arrangements. We organise music for the service and we can contact the local Florists to advise the family on all Floral Tributes and we can also arrange for flowers and wreaths to be ordered and supplied if requested. We can also arrange for donations to be sent to a charity of your choice, if requested. We offer integrity and openness in helping you to make decisions about every aspect of the funeral being arranged, including its cost and payment, leaving you in control of decisions. We always aim to alleviate as much of the stress and responsibility from the family as possible, although, it is essential to remember as professional Funeral Directors we will assist you through this process if it all becomes too stressful. There are no easy words available to describe the devastating loss, the overwhelming grief, the sense of emptiness or the awful feeling that occurs when a loved one passes away. We know that this is a difficult time, but by calling us we will be able to advise and help you in the carrying out of all the necessary arrangements in a professional and respectul manner.